Nobody likes to be broke, but unfortunately it is a reality of some of us. If you are a student and you are paying for tuition and books you may not (you probably don’t) have the freedom or flexibility in your schedule to also work full time. Unfortunately while you are studying in college or paying off your student loans after graduation your budget is limited; therefore extracurricular activities with our friends and families may be a luxury that we cannot afford. The only thing worse than being broke is everyone knowing that we are broke. We can definitely still enjoy life and live happily while also living on a budget. The key to overcoming being broke while in school and immediately after graduation is to live within our means. We always have to remember that our current financial situation is only temporary. Living within our means involves spending less money than we are earning, and always making sure that we have more money coming in each month than we have going out. 1. Shop Around for Discounts. Whether you are shopping for appliances, electronics, weekly groceries, or household cleaning supplies it’s always a smart idea to shop around. Shopping around, checking websites, and waiting for an item to be on sale can save us a lot of money and help us stay within our monthly budget. 2. Check the Weekly Flyers. You can check the weekly store flyers online or you can get the paper version of your weekly store flyers. Flyers are a great way to see which products are on sale so we can plan our shopping budget ahead of time. There may be a different name brand of a product which we need that is on sale. Changing to products that are on sale can help us save money. 3. Be Sure to Clip or Print Coupons. 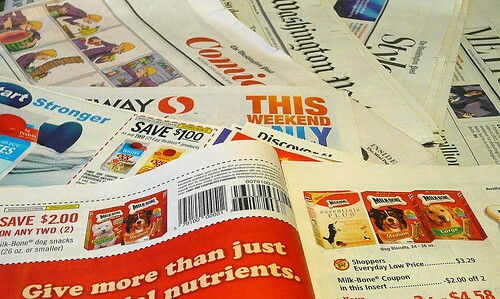 Many company websites such as P&G and Nestle offer coupons for their products. We can also sign up for websites that offer coupons for a variety of products such as www.savings.com or www.coupons.com . We can also get coupons for our favourite products by liking a company or product on Facebook and following them on Twitter. 4. Buy Your Items in Bulk. We may not need a lot of laundry soap right now, but we will always need laundry soap in the future. Not all items are cost efficient if we buy them in bulk, but items that we always need and use on a consistent basis such as toilet paper, dish soap, and shampoo are definitely cheaper if we buy them in bulk. 5. Question Your Purchases. Impulse purchases are never a good idea because they can be costly and we usually end up regretting them later. Before we make a luxury purchase we should always ask our self if we really need this item or do we just want it. Necessity items that we need for daily living are usually not impulse purchases and therefore we don’t need to wonder if we are making the right decision. I love how living on a budget gives us peace of mind. When we spend money, we know that we are spending it on the right things because of our budget. We know many of the expenses we have coming up in the future also, and that gives us a lot of comfort! Thanks for the post! @John – I agree. I love the peace of mind of living on a budget, I like knowing that I have everything that I need and still have some money in the bank account. Thanks for reading.